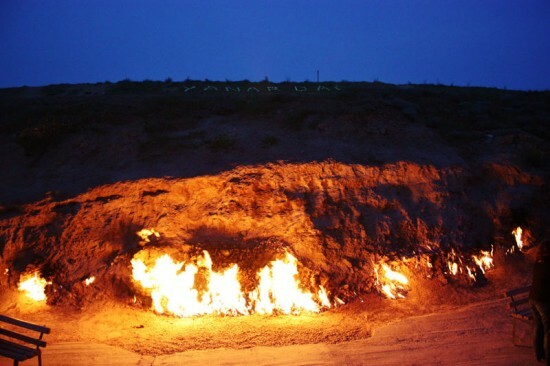 Yanar Dag – Eternal Burning Mountain in Azerbaijan | Azerbaijan, a small nation located at the crossroads of Western Asia and Eastern Europe, is well known for its rich culture and history. The country is a great tourist destination, with a unique cuisine, ancient monuments, modern architecture, and mud volcanoes. And the most well-known of its volcanoes is Yanar Dag, also known as ‘Burning Mountain’. True to its name, the mountain has been burning for as long as anyone can remember, and the fire isn’t showing signs of going out any time soon. The springs’ water is saturated with sulfur, so even though they appear harmless, they are flammable enough to be ignited by a lit matchstick. But the locals don’t appear to fear the springs at all. Instead, they believe that the water has medicinal properties and spend hours bathing their feet here. About 200 meters away from the mountain lies a weak active volcano that excretes a mixture of mud and sulfur water, also believed to have curative properties. 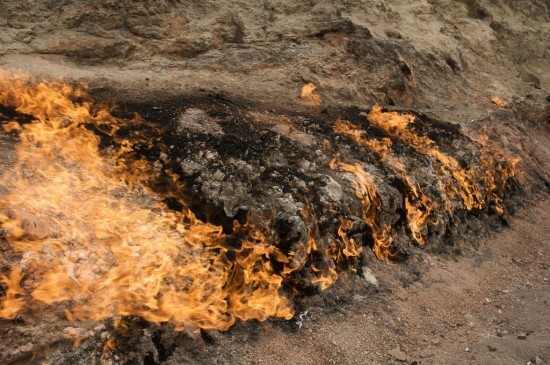 There are a bunch of local legends about the origin of the fire at Yanar Dag. One story goes that a shepherd accidentally lit a fire by tossing a cigarette, and the hill has been burning ever since. Another says that the area used to be home to a pack of ‘sensible’ wolves who made inscriptions on the walls. Scholars believe that the wolves in these tales might have been primitive men who accidentally set fire to the gas-filled mountain. But here’s the scientific explanation – Azerbaijan is a nation with enormous oil and gas reserves. 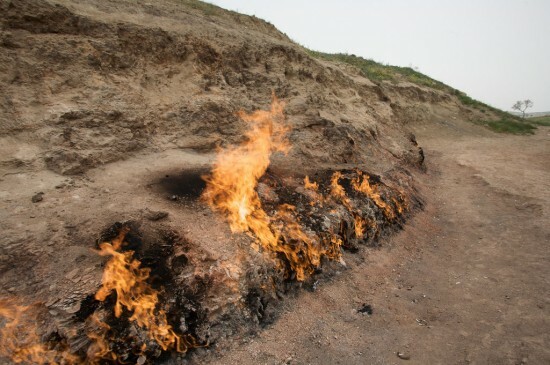 So steady gas emissions from the underlying soils cause the surface of the land to sometimes erupt in flames. 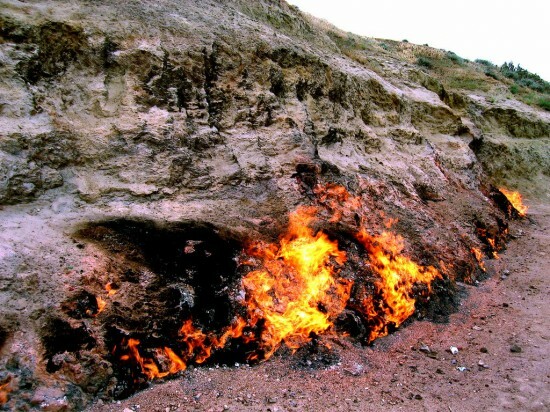 Yanar Dag wasn’t the only fire mountain in the country to begin with, but most of them went out after humans began to exploit these resources and the underground pressure reduced. Historical records are proof of this – Venetian traveler Marco Polo is said to have observed numerous flames all over the Absheron Peninsula on his visit to Baku in the 13th century. The famous French writer Alexandre Dumas also witnessed these flames five centuries later. “This is absolutely the most interesting and fascinating thing, which can be seen nowhere else,” he wrote. Even today, the flames never fail to amaze tourists and locals alike. 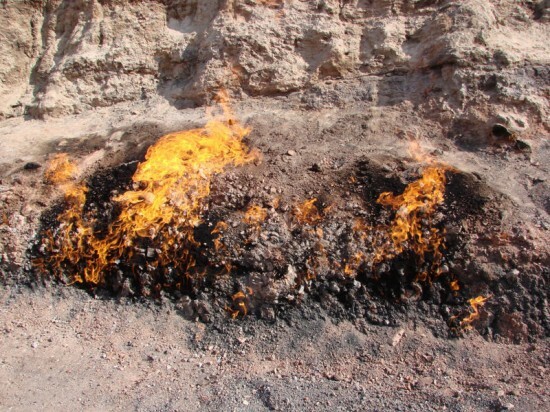 These natural fires have always inspired humans , and played a crucial role in the creation of mystical faiths like Zoroastrianism, centered on ceremonial fire cults. Yanar Dag is now a protected site, with extensive archeological studies being conducted in the area. Yanar Dag from ProjectExplorer.org in Azerbaijan from ProjectExplorer.org on Vimeo.